You use the Mac menu bar to access all sorts of information about your Mac. 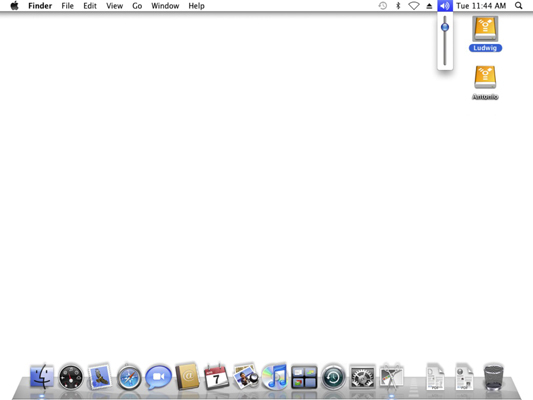 Depending on your hardware, Mac OS X Snow Leopard installs several menu bar icons. The Volume icon is always there by default, along with the Clock display, which is actually an icon in disguise. Adjust your Mac with a click of these menu icons. Some icons won’t appear unless you turn them on. For instance, the Displays icon won’t appear unless you enable the Show Displays in Menu Bar check box within the Displays pane in System Preferences. The Displays menu bar icon, which looks like a monitor, lets you choose from the recommended resolutions and color depth settings for your graphics card and monitor. To quickly change the audio volume level within Mac OS X, click the Sound Volume icon (it looks like a speaker with emanating sound waves) once to display its slider control; then click and drag the slider to adjust the level up or down. After you select a level by releasing the mouse button, your Mac thoughtfully plays the default system sound to help you gauge the new volume level. Modem status: You can turn on the display of the Modem status icon from the corresponding modem panel on the Network pane in System Preferences. The icon can be set to show the time that you’ve been connected to the Internet as well as the status of the connection procedure. AirPort: If your Mac is equipped with an AirPort or AirPort Extreme card, you can enable the Show AirPort Status in Menu Bar check box within System Preferences. To do so, click the Network icon and then choose your AirPort connection in the column at the left. The AirPort status icon displays the status of the AirPort connection; click the AirPort icon to toggle AirPort on or off. The icon displays the relative strength of your AirPort signal, whether you’re connected to a Base Station or a peer-to-peer computer network, or whether AirPort is turned off. You can also switch between multiple AirPort networks from the menu. Bluetooth: For those Macs with Bluetooth hardware, you can toggle Bluetooth networking on or off. You can also make your Mac discoverable or hidden to other Bluetooth devices, send a file to a Bluetooth device, or browse for new Bluetooth devices in your vicinity. Additionally, you can set up a Bluetooth device that’s already recognized or open the Bluetooth pane within System Preferences. Time Machine: If you’re using Time Machine to back up your Mac automatically, this icon displays the date of your last backup. You can also manually start a backup from the menu bar icon. To display the icon, open System Preferences and click the Time Machine icon; then click the Show Time Machine Status in the Menu Bar check box to select it. PPoE: The display of this icon is controlled from the PPoE settings on the Network pane within System Preferences. Click this icon to connect to or disconnect from the Internet using Point-to-Point over Ethernet (PPoE), which is a type of Internet connection offered by some digital subscriber line (DSL) providers.